I thought I was going to escape the jerks this spring, as the vast majority of drivers are wonderfully polite, but unfortunately they are around, as I found out this last week. Then yesterday I was riding near Raspberry Gully, about to enter the track from the road, when a van driver, seeing me, cut a corner he was rounding so that he could drive close to me. Then he yelled out “No helmet!” I am not sure why he thought that my not wearing a helmet was more noteworthy than his driving on the wrong side of the road so that he could endanger me, but whatever. These two incidents are obviously mild. I was not passed extremely closely and I was not yelled at so loudly that I startled and swerved, which has happened in the past. Neither were the drivers extremely aggressive, just mildly annoying. I understand the frustrations of driving, I personally find it to be one of the most frustrating things I do. But I don’t vent my frustrations on others. Does anyone else find that there are more jerks on the roads in Spring? 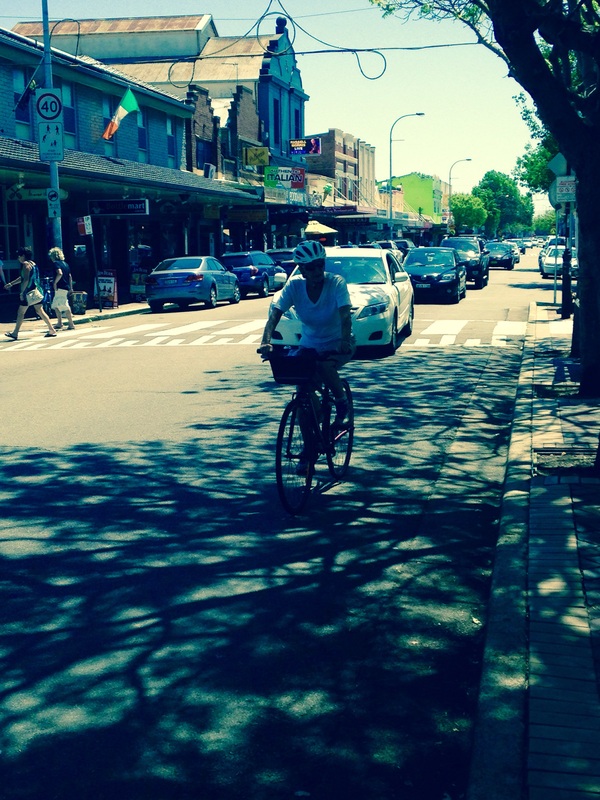 This entry was posted in Uncategorized and tagged cycleways, helmets, Raspberry Gully, street cyclist, women on bikes. Bookmark the permalink. Yes they are. Last Thursday I decided to ride in for lunch with my wife at Glendale TAFE. Anyway along the Woodrising stretch some Idiot thought he would drive passed real close and sound his horn. It’s not like I was holding up traffic I was kicking a long at approx 50km/hr and well inside the designated cycle lane which is about 1.5m wide. Would have loved to have given him a good smack down but a two finger wave had to suffice. Not a lot you can do. Yes I agree there’s not a lot you can do, and I omitted my response to the second incident in this post … I talked to some friends about springtime incidents and a few of them said they’d had similar experiences lately too. I’ve had far worse in the past, let’s hope it is improving now. There seems to be a lot of strange driving in general during Spring and, in particular, people who just have no concept of there being anyone else on the road (or footpath) who might be affected by their actions. I had a guy pretty much stop right across the footpath as I was walking to the supermarket this afternoon and it wasn’t deliberate – he just had no idea where he was or what he was doing. And yesterday, when I was taking my bike out for a test ride to work, someone went past me and then pulled up beside the road. Lucky I slowed down, because they then decided they were at the wrong place and had to creep forward some more, vastly confusing me and two other cars on the road at the time. IMO, the way a driver behave with others, especially vulnerable cyclists on road, is an insight into the connection between individual and power. You are right about the helmet: it’s not a really a secure tool if you’re riding slowly, a sort of imposture. A hot weather can reduce our lucidity: in that case the best tools are good eyes and good ears. In my country (France) we have the choice, the law seems to be more friendly with cyclists. It reminds me a policeman who told me several years ago “under 20 Km/h, risk is closely the same with an helmet”, we could say also a phrase for walker “under 6km/h, risk is…”. He he …! Great comment Laurent! I’ve never hear that before about the speed. And yes, the helmet laws seem to be used as a weapon against cyclists. I have had similar experiences in the last couple of weeks too. So much so I have commented on it to friends. This brings up a couple of thoughts: is it the spring mating hormones (the same ones that make the magpies swoop and attack)? Why is it that this kind of honking and yelling seems to only come from men?